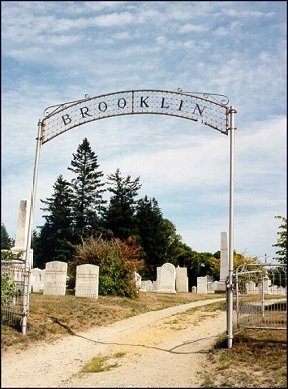 The Brooklin Cemetery is located on Route 175, in the center of town. It is the largest cemetery in Brooklin. Below is information from a few headstones which I photographed in 1999. For a more complete record of persons buried in Brooklin, I suggest that you consult: The Cemeteries of Brooklin, Maine: A Guide to Gravestones, Monuments, Public and Private Burial Grounds, compiled by Roxanne T. Sly and Clare Sullivan. It was produced for the occasion of Brooklin's Sesquicentennial, 1999 and costs about $10. The book only provides year of death (and where given, the year of birth.) It does not contain the full headstone inscription. Possibly the book may still be available from the Sedgwick-Brooklin Historical Society. Each link below will take you to a photograph of the headstone. If you find photographs of headstones of your ancestors, feel free to save them to your own files, however, they may not be reproduced for commercial purposes. If you have photos of stones which are not included here and would be willing to share them, please send them to Xana Arango Hansenfor inclusion on this website. have been born about 1805 to 1807. Mrs. Lois Allen, wife of Jonathan Allen, Jr.
& daughter of Mr. John and Mrs. Lois Dougherty. <> Died Oct, 7, 1828, aged 21 years, 8 mo. & 15 days. Twould been my love for you. But Jesus called my soul away. Died Nov. 26, 1889, AE. 71 yrs, 3 m's, 26 ds. Died Mar. 13, 1882, AE 83 y's, 2 m's & 13 d's. Died Feb. 17, 1885, AE 85y's 10 m's & 13 ds. Died June 4, 1850, AE 77. And wake thee with its glorious light. Died Feb 11, 1850, AE 72. And then arise and be an angel still. Died Dec. 11, 1863, AE 69 y's, 8 m's. Died May 8, 1877m AE 89 y's & 6 m's. Our mother has gone home to rest. Died Feb. 14, 1848, AE't. 73. Died Dec. 4, 1831 AE 53. Died Mar. 14, 1862 AE 76. Blessed are they which die in the Lord. Died June 23, 1860, AE. 52. Them that sleep in Jesus are blest. Though we here may meet no more. Yet there is a brighter shore. We that loved shall meet again. Died Jan. 8, 1866, AE. 44 ys, 3 ms, 11 ds. Tis but the casket we've laid in the tomb. The gem was too pure for earth's shadows and gloom. To blend with ___________ of Heaven.